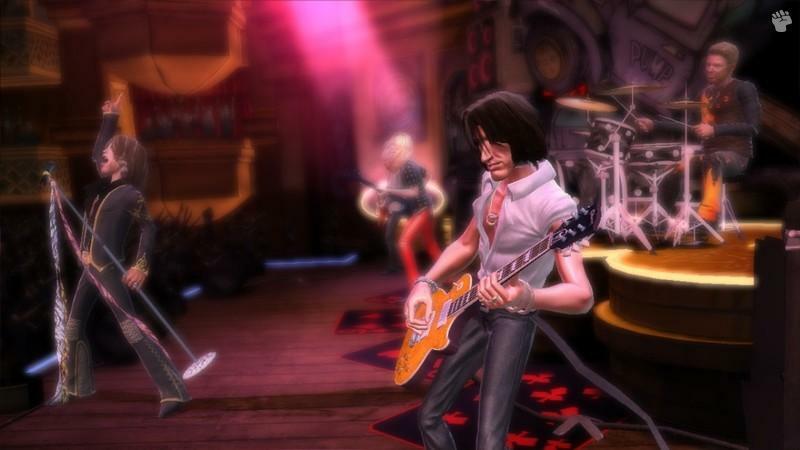 The latest Guitar Hero title jams its way onto the XBox 360, PlayStation 3, PlayStation 2 and Nintendo Wii which revolves around one of the world's legendary rock groups... Aerosmith. This review will focus on the XBox 360 version that also includes the new Aerosmith inspired guitar that will have you jamming with Aerosmith with some of their most popular hits. For those unfamiliar with the Guitar Hero series, it basically allows the gamer to play a variety of real-word rock 'n' roll tracks with the realistic guitar addon for your console. Featuring five different coloured buttons on the guitar, the gameplay will display the relevant colours on the screen as circles which must then pushed in unison on the guitar with the strum button. 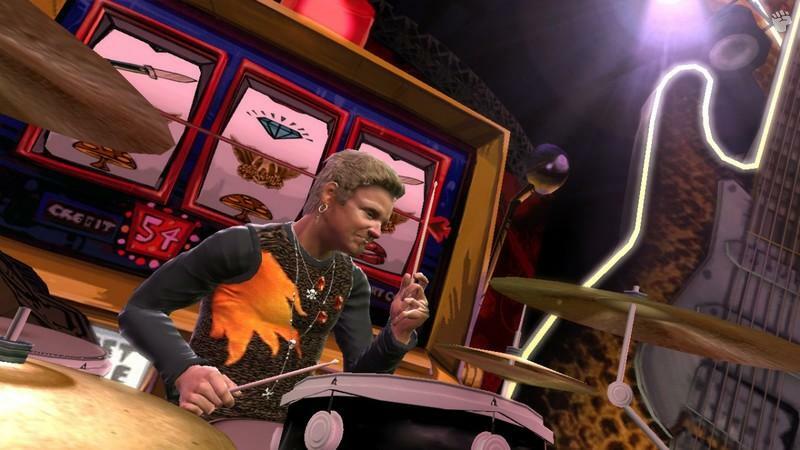 If you manage to pull off the correct notes in conjunction with the notes on the screen, the guitar rift of the song will be played and the more correct notes you play, the higher the points you will be allocated and this includes multipliers and a "rock meter" which makes for some challenging yet entertaining game play. It should also be noted that all guitars from this franchise will work on this title, however if you have purchased the Aerosmith bundle, it's basically a wireless Les Paul guitar with a Aerosmith template which will still allow you to reenact your Rockstar dreams. 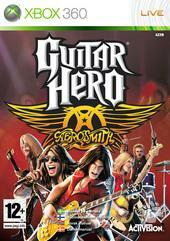 Guitar Hero Aerosmith takes players on a true nostalgic journey of this legendary band as they play through various highlights of this bands career with some of their greatest hits that include Sweet Emotion and Walk This Way. Although the majority of songs included are Aerosmith, the title also contains a plethora of other musical greats and the venues that you play at are also inspired by some of the tours of Aerosmith. Speaking of Tours, you also receive an Aerosmith Tour Book that is an almost historical guide of the band itself. Guitar Hero: Aerosmith, the first game built around the legendary music of America’s Greatest Rock ‘N Roll Band: Steven Tyler, Joe Perry, Brad Whitford, Tom Hamilton and Joey Kramer. Gamers will experience Aerosmith’s GRAMMY winning career, from their first gig to becoming rock royalty, in a way that no other entertainment vehicle offers. As fans progress through their careers in the game, they can rock out to scores of Aerosmith’s greatest hits, as well as songs from celebrated artists that the band has either performed with or has been inspired by in some way. Venues from historical moments during the band’s illustrious career offer the experience of “sweet emotion” and further capture the essence of the band’s rise to fame. Before we get into the crust of the review, it should be noted that there have been a few complaints about this compilation in regards to the amount of Aerosmith content and the price of the title. For these naysayers, the price is justified and although I have not heard of half the Aerosmith content on this version of Guitar Hero, there was only one or two tracks that I did not enjoy. Speaking to other people who have the game, their reaction was also the same. Yes, at the end of the day, it's Aerosmith but it's also another addition to the Guitar Hero franchise and the more the merrier in our books. The gameplay is reminiscent of the previous Guitar Hero games and in order to keep your crowd happy, you need to ensure that your rock meter is in the "green" area and the more incorrect notes you play, the lower this meter becomes until you eventually get booed off the stage. 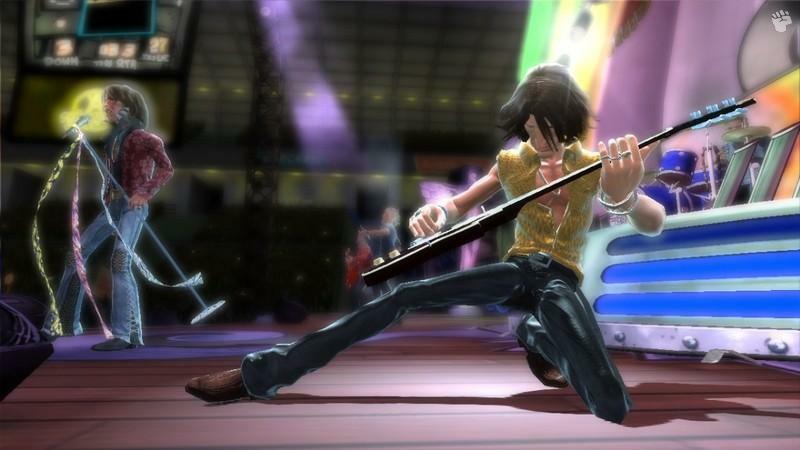 You are also awarded more points for hitting 50 notes in a row, 100 and so-on which assists with the online leader boards and gives the player "money" which can then be used to purchase new items for your character such as clothes or guitars. The career mode in game has 31 songs which is broken down to 19 from Aerosmith, 12 from other bands and 10 unlockable songs. There's even some challenging boss modes where you basically need to beat your opponent by throwing him a variety of distractions from blowing up his amp to snapping his guitar cords. However, this can easily backfire on your character too and as you progress through the game, the songs and challenges becomes more and more frustrating. 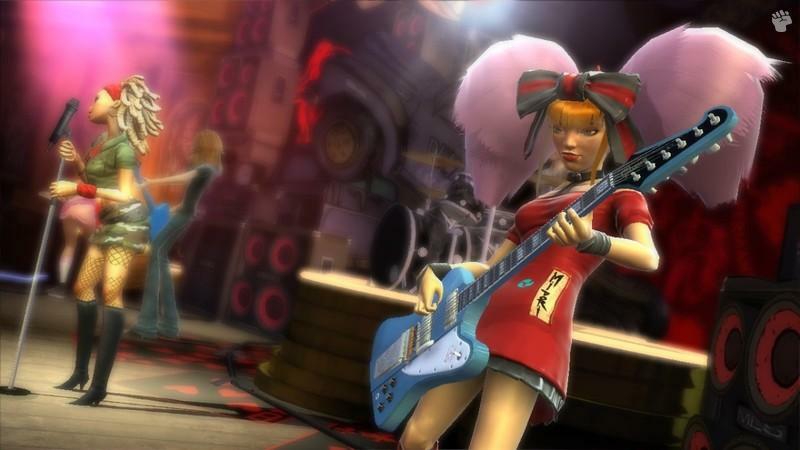 For fans of multiplayer, the title also allows you to play cooperatively with another player as one person plays the lead and the other rhythm or bass guitar, two guitars are of course needed for this. You can even go head to head with people online and offline or challenge them in a battle as you attack your opponents with broken strings and the like which is similar to a boss level in the single player mode. Graphically, the title albeit simplistic on the XBox 360 suits the genre perfectly and the likeness of all the members of Aerosmith (Steven Tyler, Joe Perry, Brad Whitford, Tom Hamilton and Joey Kramer) all look like caricatures of their real-world counterparts. The texture details looks fantastic on a high definition TV and match that with the odd special effect here and there and it's easy to get drawn into the world of rock 'n' roll. The stadiums have also been faithfully recreated and where the player is truly awarded (provided you're an Aerosmith fan) is by the unlockable video content of the game which has real interviews of the stars of Aerosmith. 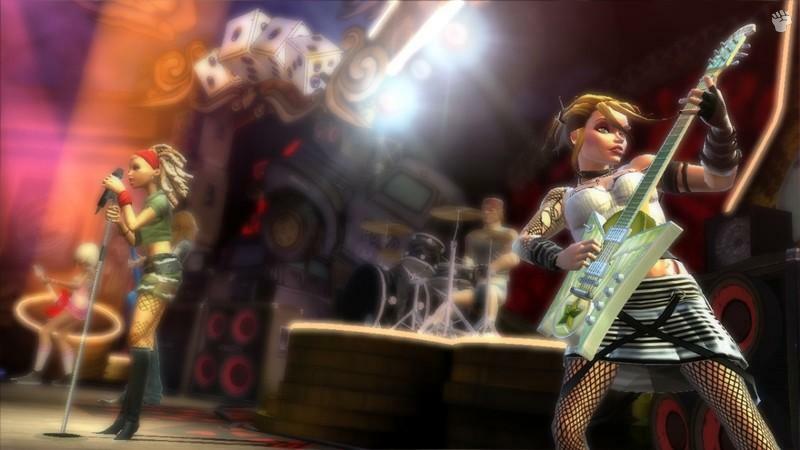 My favourite aspect of the graphics is that the way your character interacts with the music and crowd and speaking of the crowd, this current incarnation of Guitar Hero has probably the best crowd effects on any game. In conclusion, if you are an Aerosmith fan and have never played Guitar Hero before than I highly recommend that you purchase the bundle pack which comes with the guitar. Even if you're not an Aerosmith fan, the title is still quite fun and there are tracks by Cheap Police and even Run D-M-C which will keep you entertained and challenged. Definitely another must have by Activision!